Located in the heart of Valle dei Laghi, between Trento and Garda lake, Santa Massenza represents a borderline and, just like a border has to be, it unifies and connects two different territories: the southern climate meets the continental one, the Mediterranean vegetation lives together with Alpine species, making this area incredibly unique. 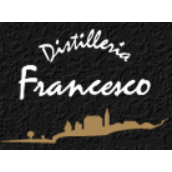 In this little village, where wine and distillation traditions are passed down generation after generation, is located the Azienda Agricola and Distilleria of Francesco and Alessandro Poli. Five generations of tradition and customs are preserved and passed down year after year, enriched by new technologies, but always respecting the family heritage. Alessandro Poli shares now a century of history with his family. Since 1998 the vineyards are cultivated with biological methods. Bio-dynamic techniques and formulations are used, which improve the soil fertility and keep the integrity of vines and grapes, so that the wines are real expression of the territory. Right after the harvest, we distillate the best wine marc slowly with “water-bath”, according to the local tradition, this is a slow and onerous method which produces though the finest grappas, preserving the aromas and fragrances of the original grape. Our first alembic is with “daily quote”, working with wood and located in the family house. 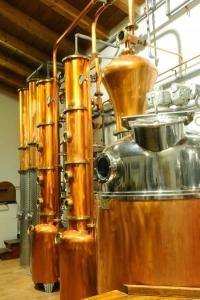 After the construction of the company building, our distillery has been completed renovated with two new “water-bath” alembics. 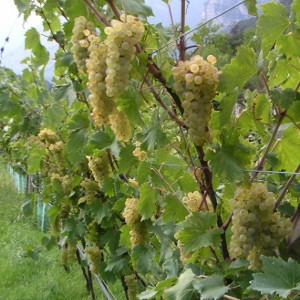 The top variety is Nosiola, a Trentino historical indigenous grape with white berries, which is used to obtain “Vigna Sottovi”, and after maceration and refining in acacia barrels, the more complex “Majano”. The blend of Nosiola and Pevarella, white grapes of Trentino tradition, and after the re-fermentation with “Martinotti” method, results in Massenza Belle, which is also presented in a version “on the yeast”. In the area called Naran, which is located 550 mt. a. s. l. at the foot of Monte Gazza and Paganella, naturally strong wine varieties are grown, they do not need antiparasitical treatments: Bronner and Solaris are blended in “Naranis”, an aromatic mountain wine with 0 environmental impacts. A grape which has always been cultivated on the hills of Santa Massenza is the autochthon Schiava, from which a fresh and fruity rosé wine. The Rebo grapes, wine cross created in the Fifties by Rebo Rigotti, result in “Massenza Rosso”, wine with structured body with scents of red berries. More complex, thanks to the refining in wooden barrels, are Cabernet Sauvignon, with typical note and strong personality, and Lagrein “Vigna Le Valete” with ample and spicy aromas, velvet and soft taste. 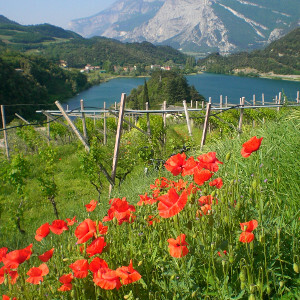 It originates from the best bunches of Nosiola dried on typical “arele” by Ora del Garda, a gentle breeze originated from the homonymous lake. The pressing of grapes, on which the noble mildew “botrhytis cinerea” has developed, takes place during the “holy week” according to tradition. After years of fermentation and refining we obtain this great wine with complex bouquet and sweet elegance, which represents a perfect union of history, tradition and territory, and where the patience of waiting brings to a spectacular wine, able to face the time passing by.